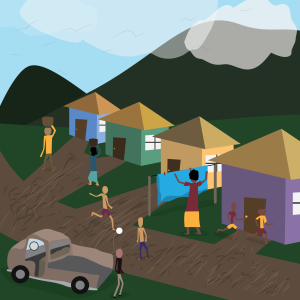 What do we understand when we here the phrase “Building communities?” For one, we think about the physical infrastructure – roads, utilities and communications networks – that connected the various parts of our island home, Dominica. This year’s theme asks us to consider how the former slaves who won their freedom in 1838 Emancipation were able to travel all around the island to make a life for themselves. We think of how they connected with the Kalinago communities during and after slavery, and how they were able to navigate business and personal life among the colonial settlers during that period. But the idea of building communities applies to more than just the physical and material ways that our villages and towns have grown, from wood and zinc shanty houses to brick and mortar mini-mansions. The idea refers to the social and spiritual ways of life that have been used by our ancestors during that time period to unite us to form a distinctly Dominican culture and identity. This year’s Dominica History web project, brought to you by Create Caribbean Research Institute at Dominica State College in collaboration with the Division of Culture, reflects on the theme “Building Communities 1838-1938” to illustrate how Dominica’s villages and towns have been formed, developed and created solidarity and unity among our people. This project is a collaboration between Create Caribbean Research Institute at Dominica State College and the Division of Culture in the Ministry of Youth, Culture, Sports and Constituency Empowerment. Copyright © 2016 Create Caribbean Inc.